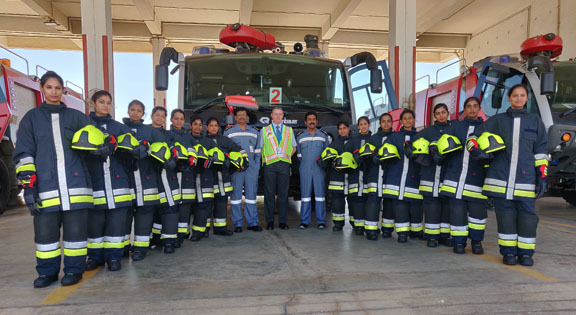 The Bangalore International Airport Limited (BIAL) – operator of the Kempegowda International Airport, Bengaluru – on February 19, 2018, inducted 14 women firefighters into its Aircraft Rescue & Fire Fighting (ARFF) squad. 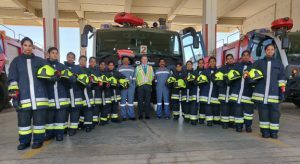 With this, BLR Airport becomes the first Airport in the Country to have women firefighters and probably the first Asian Airport to have a female contingent of this size. Recruited from across Karnataka, the girls are currently undergoing basic training at the BLR Airport. They will travel to Kolkata for four-month extensive training at the Airports Authority of India’s Fire Service Training Centre, beginning March 11th. The representation of women in an Airport firefighting squad marks a significant milestone in Indian aviation – a drastic transformation in the field that has been traditionally male-dominated. With second Runway and Terminal 2 set to become operational in 2019 and 2021, respectively, this recruitment will further strengthen the BLR Airport’s emergency preparedness.